TOKYO—Prime Minister Shinzo Abe has made strides over the past year to end Japan’s long bout of debilitating deflation. He’ll announce still more measures this week designed to stir economic growth. In that, he faces a fundamental choice: Is Japan willing to shake up long-standing customs and business practices to achieve growth on par with the U.S. and the healthier European economies? Or will Tokyo settle for low-risk, low-return policies that might slow the decline but do little to reverse it? He sees Japan’s economy growing soon at a 2% annual pace, twice that of the previous 20 years, and only slightly lower than the Federal Reserve’s estimate of the U.S. economy’s growth potential. Improving long-run growth prospects is now a big issue for policy makers globally. Governments and central banks responded to the recent recession by trying to spur demand with interest-rate cuts and spending programs. Now they’re facing persistent headwinds to rising prosperity, like slow population growth and sagging workforce productivity. But Mr. Abe’s new “growth strategy”—an updated version of a program first announced a year ago to poor investor reviews—suggests he’s using not a drill bit but a sculptor’s chisel, chipping around the edges of Japan’s economic foundations. Early drafts released in advance of Tuesday’s formal unveiling show a pattern of proposals scaled back or obfuscated, leaving crucial details, like size and timing, blank. The plan will include a corporate-tax cut, from the current rate above 35%, to “below 30%,” in line with the average of about 29% among nations in the Organization for Economic Cooperation and Development. But it won’t specify the new rate, how long it will take to get there, or what offsetting tax increases will be included to contain Japan’s bloated debt. Many changes are left to new “special economic zones” with extra freedom to cut through red tape constraining everything from hiring and firing to agriculture land ownership and management. But it will be months, or even years, before it’s clear what, if anything, they’ve actually cut. This is Mr. Abe’s second attempt to fire the “third arrow” of his Abenomics revival program. The first two arrows—a massive increase in money printed by the Bank of Japan and a sharp boost in public-works spending—did raise growth over the past year and push inflation to an annual rate of 1.3%, up from a 15-year average of 0.3% deflation. Japan’s “growth potential” has shriveled from an annual pace of 4% in the late 1980s to less than half a percent now, according to central-bank estimates, the result of a shrinking population, cutbacks in capital spending and stagnant productivity. Raising that figure is what the third arrow is supposed to do. There’s plenty of low-hanging fruit that could bear quick results. Economists say Japan could make gains in rolling back regulations just by carrying out some simple proposals that face minimal political resistance, like allowing electronic submission and processing of export and import documents. 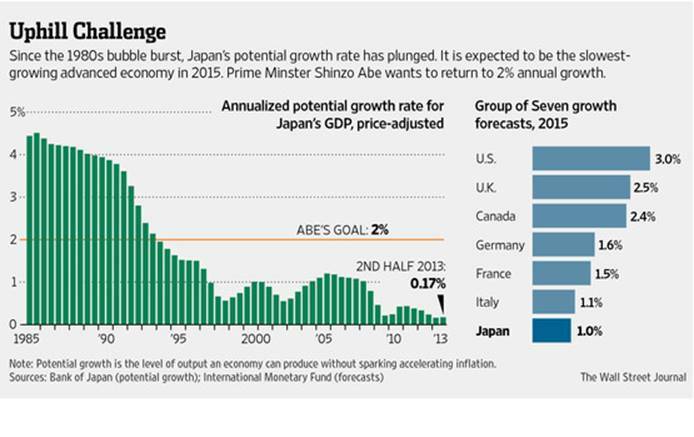 But Mr. Abe is making only modest changes in policies seen as most significant in constraining growth and efficiency. A case in point: easing Japan’s unusually tight restrictions on immigration, as well as limits on hiring, firing and pay. As a nod in that direction, Mr. Abe is proposing a slight increase in the number of sectors that can bring in a few thousand foreign guest workers, as well as an extension of their temporary stay to five years from three. The question Mr. Abe has yet to answer with clarity is whether, in pursuit of stronger growth, he is willing to try to rewrite Japan’s social contract.